The Historical Section of the SAIEE has many artifacts of historical interest in its collection and has an association with Eskoms historical collection. This remarkable lightning recorder is the only surviving instrument from the Transvaal Meteorological Station at the Johannesburg Observatory. 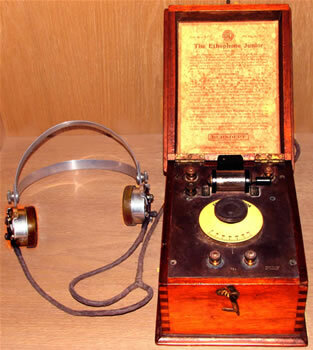 Its operation was based on the Marconi coherer wireless telegraphy receiver. The coherer is mounted between the two perforated brass posts to the left of centre of the instrument. Lightning impulses induced in an external antenna caused the coherer to conduct and operate the telegraph relay situated on the right hand side of the instrument. The relay activated the armature of the central assembly having a striker that de-cohered the coherer. The vertical arm attached to the armature held a pen which wrote on the helical chart rotated by the clock on the extreme left and a gong warned the operators that an event had been recorded. As far as we have been able to determine this is the sole surviving instrument of this type. For further details see Vermeulen, DJ. 2000. The Historical Interest Group re-discovers Popov. Elektron 17(6), June:13. The instrument is part of the South African Institute of Electrical Engineers historical collection and can be viewed in Observatory, Johannesburg, South Africa. 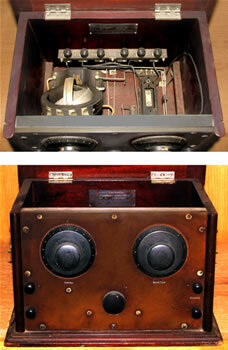 In the 1920s the German manufacture Loewe Radio produced a series of receivers in which several valves and their coupling components were assembled in a common envelope. The only additional items required were the tuning inductance/reaction coils and the tuning capacitor seen in the illustration. This amplifier integration was not easily achieved as each resistor and capacitor had to be individually encapsulated to ensure that they would not contaminate the vacuum. The main reason for this surprising innovation was to minimise the German licence fee that was based on the number of valves used in a set. Electronics started in 1907 when the American entrepreneur, Lee De Forest, invented the first electronic amplifying device. 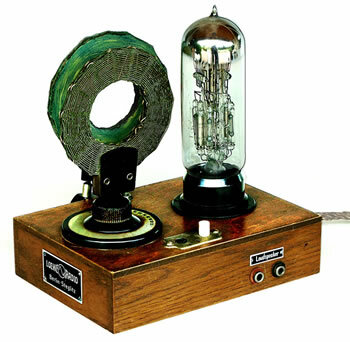 He named it the Audion and it was subsequently known as the triode vacuum tube (valve). De Forest promoted his invention extensively and made a special version for telephone repeater service (right hand side illustration). 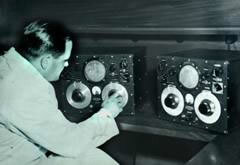 He persuaded the Western Electric Company (WE) to pay him $50 000 for the exclusive rights to use the Audion in the telephone industry. His original crude device was not suitable for industrial application and WE assembled a team of scientists to develop it into a practical unit. In 1914 The South African, Dr Hendrik van der Bijl, analysed its performance mathematically and designed practical tubes for use on the first transcontinental telephone circuit linking New York and San Francisco (centre and right hand illustrations). For more information see Vermeulen, DJ. 1998. The remarkable Dr Hendrik van der Bijl. Proc IEEE 86(12), December: 2445-2454. All three of these unique valves form part of the South African Institute of Electrical Engineers historical collection and can be viewed in Observatory, Johannesburg, South Africa. Electrical power suppliers were legally required to maintain mains frequency within close limits. Over 24 hours the total number of cycles generated had to be controlled to ensure that synchronous time keeping devices would remain accurate. 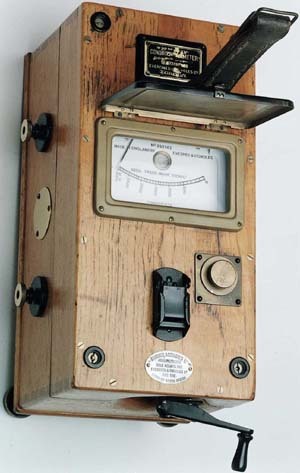 From the mid-1920s until they were linked with Eskom the equipment illustrated was used to monitor the Johannesburg supply frequency. The accurate pendulum clock was kept in step with standard South African time by regular corrections. 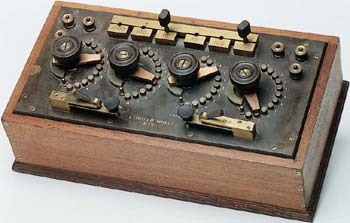 The mains frequency drove a synchronous clock motor and a comparison between this and the clock time was made every 15 seconds and any discrepancy showed as a deviation between the two pointers of the main dial. The two smaller clock faces showed mains time and clock time respectively and were useful when the deviation exceeded 3 minutes. For further information see Vermeulen, DJ. 2001. Mains frequency control. Elektron 18(11), November:29. The clock is part of the South African Institute of Electrical Engineers historical collection and can be viewed in Observatory, Johannesburg, South Africa. The Tellurometer measured distances between 3 and 50 km with an accuracy of 3 parts in 106. Instruments were set up at each of the two required points and the distance between them was calculated from the time taken for a radio signal to travel from one end to the other and back again. Once the terminal stations were established the distance could be measured in less than half an hour where previously, using hand methods, it had taken a team several months to complete the same operation. The Tellurometer was invented and developed by Dr Trevor Wadley working at the CSIR Telecommunications Research Laboratories and was subsequently manufactured in South Africa. By 1971 it had earned over R12 million in foreign exchange. This instrument revolutionised land surveying as it became possible to measure distance as quickly and accurately as measuring angles. The satellite based Global Positioning System has subsequently produced a second revolution in surveying technology. 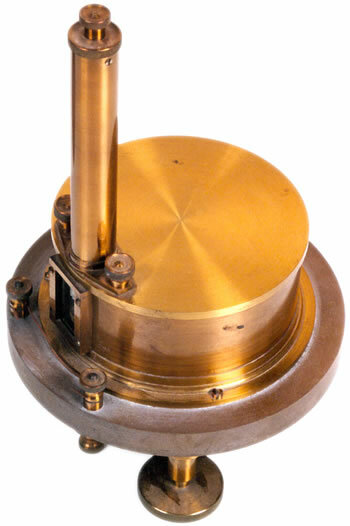 The Tellurometer is part of the South African Institute of Electrical Engineers historical collection and can be viewed in Observatory, Johannesburg, South Africa. X-rays were discovered by the German Wilhelm Röntgen in 1895. In 1896 primitive equipment was already in use in South Africa. By the end of the Anglo-Boer war there were probably as many as 20 X-ray units in operation. This tube is typical of early units that depended on a rather poor vacuum of about 10 mPa to produce cathode rays (electrons). The cathode lies on the right hand side of tube with the anode mounted at an angle in the centre of the tube. X-rays were produced when the electrons collided with the anode. Such early tubes produced rather low intensities requiring photographic exposures of several minutes. Dimensions: 360 mm x 100 mm wide x 320 mm high. A British supplier, Newton & Co, sold this tube but the manufacturer is unknown. For further details see Vermeulen, DJ. 2002. Early X-ray equipment: a view from the south. Engineering Science & Education Journ, December 11(6): 231-242. The tube is part of the South African Institute of Electrical Engineers historical collection and can be viewed in Observatory, Johannesburg, South Africa. STEAM TURBINE DRIVEN DC GENERATOR manufactured by Greenwood and Batley Limited at Albion Works in Leeds, England. It is believed to have been built circa 1900. Greenwood and Batley Limited donated this DC generator to the University of the Witwatersrand in Johannesburg. The university donated it to the enthusiasts of the Rand Society of Model Engineers. In exchange for spare parts for another DC generator, the Rand Society of Model Engineers gave Greenwood and Batley’s DC generator to ESKOM. This steam turbine driven DC generator is currently on display at Gold Reef City in Johannesburg. Sabie River Gorge power station operated from 1 April 1928 until it was decommissioned on 5 November 1964. James Gordon & Company Limited of London manufactured the three turbines in 1925. A Francis type turbine and alternator, 450kW 600kVA 750rpm, three-phase, 50 cycles, 3300 volts. 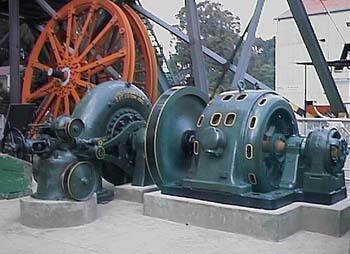 The turbine and alternator operated under 64 metres static head of water. The turbine is on loan to Gold Reef City, Johannesburg. It can be viewed at the mine-shaft in this theme park. A COMPRESSED AIR METER used in conjunction with a Venturi in the airline. Compressors at Rosherville Power Station supplied air to a compressed air grid. This grid supplied air to the Central District Gold mines. This meter was located at Rose Deep gold mine. The meter has a unique air-driven clock. The meter is on loan to Gold Reef City, Johannesburg. It can be viewed at the entrance to the mine-shaft in this museum and theme park. 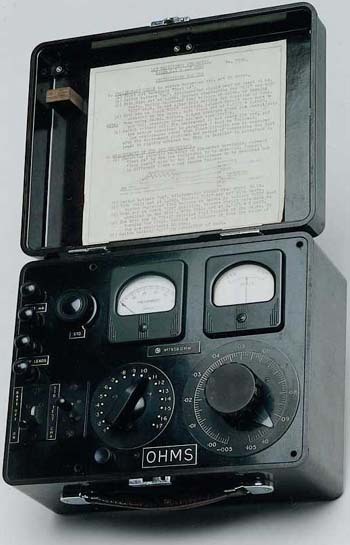 A PORTABLE DC VOLTMETER manufactured in England by Cambridge and Paul Instrument Company. Circa 1920 - 1924. Portable, dual range, moving coil instrument for voltage measurement up to 25 millivolts DC. 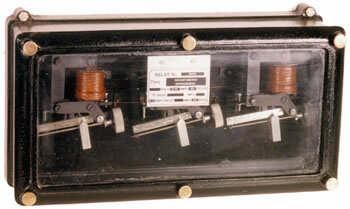 The voltmeter is now part of the South African Institute of Electrical Engineers historical collection and can be viewed in Observatory, Johannesburg, South Africa. 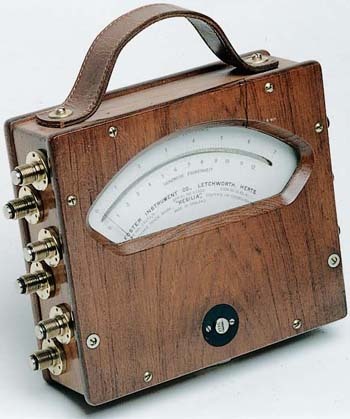 A PORTABLE MULTI-RANGE LABORATORY OHMMETER believed to have been used in 1900. It measured resistance up to 1250 ohms. The manufacturer is unknown. "After having selected the proper sensitiveness, before making the measurement, the crank is to be set either on button 1, 3, or 5, corresponding to the sensitiveness which has been chosen, whereupon the key on the left hand side should be depressed and the button on top turned until the pointer indicates zero. The resistance, to be measured, is then inserted between the terminals on the right, with the crank set on the button, corresponding to the sensitiveness, and with the key in the middle depressed. The resistance is then read from the scale. The storage batteries are to be connected with the terminals on top of the apparatus before taking the measurement, in accordance with the accompanying sketch. The ohmmeter is now part of the South African Institute of Electrical Engineers historical collection and can be viewed in Observatory, Johannesburg, South Africa. A "RESILIA" PORTABLE TEMPERATURE INDICATOR manufactured by Foster Instrument Company, England. Circa 1945. Using a thermocouple as a sensor, it measured temperature. Scaled 0 - 7 x 100°C and 0 - 12,9 x 100°F Mirror scale. Provision is made for the simultaneous connection of 6 thermocouples, any one of which may be selected by key switch. A portable instrument in a wooden case. Approximate overall dimensions 300 mm x 80 mm x 290 mm. The indicator is now part of the South African Institute of Electrical Engineers historical collection and can be viewed in Observatory, Johannesburg, South Africa. A PORTABLE CURRENT TRANSFORMER made by Ferranti Limited at Hollinwood, Lancashire, England. Circa 1910. The Victoria Falls and Transvaal Power Company Limited (VFP) was the original owner of the instrument. Ratio 400/5A 7,5VA 50Hz Class AL Tested at 2000V With secondary shorting switch. A portable instrument in wooden case with leather carrying handle. It is labelled "VF & TP Co., Ltd. Test Dept." Approximate overall dimensions 225 mm x 220 mm x 270 mm. 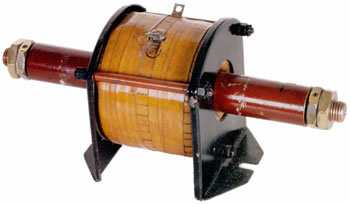 The current transformer is now part of the South African Institute of Electrical Engineers historical collection and can be viewed in Observatory, Johannesburg, South Africa. 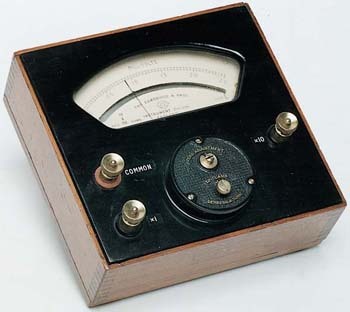 AN AC/DC PORTABLE WATTMETER manufactured in the USA by Weston Electrical Instrument Company, Newark, New Jersey in 1920. It was standardized at Weston Laboratory, Audry House, Ely Place, London. It is a portable, laboratory type, sub-standard, dynamometer instrument for measuring power in AC or DC circuits. The wattmeter is now part of the South African Institute of Electrical Engineers historical collection and can be viewed in Observatory, Johannesburg, South Africa. 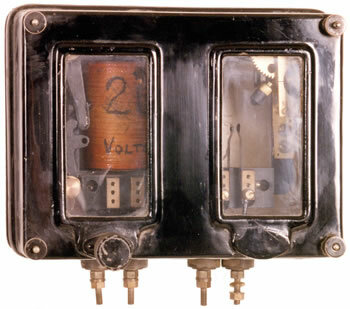 A VOLTAGE RATIO BOX manufactured by H Tinsley and Company, London. Circa 1930. The 'volt box' or 'ratio box' is used in conjunction with a potentiometer if the voltage to be measured is above about 2V. It consists of a high resistance having a number of accurately placed tappings and performs the function of a potential divider. A PORTABLE LOW RESISTANCE OHMMETER. Circa 1940. ESCOM’s Test Department is thought to have made the instrument. The instrument was used to measure low resistance up to 1,8 ohms. Range 0,1 – 1,8 ohms Detailed operating instructions are shown on the inside lid. The instrument is now part of the South African Institute of Electrical Engineers historical collection and can be viewed in Observatory, Johannesburg, South Africa. A PHASE SPLITTING RESISTANCE BOX made by H Tinsley and Company, London. Circa 1930. The Tinsley Phase Splitting Resistance consists of a variable number of non-inductively wound resistance coils. It is used in series with a variable capacitance to produce the quadrature phase of a 2-phase Drysdale phase-shifter when the available supply is single phase. The Drysdale phase-shifter is an essential component of the Drysdale-Tinsley AC potentiometer used for the accurate measurement of alternating currents and voltages. A PORTABLE AC/DC WATTMETER made by Elliot Instruments, United Kingdom. Circa 1940. It is a portable laboratory type, precision, dynamometer wattmeter, for measuring power in AC or DC circuits. Ranges: 0 - 55W and 0 - 110W Range selection by terminals and links. For use on a bench, the instrument has levelling screws and crossed spirit levels. It is mounted in a wooden case with a lid and carrying handle. 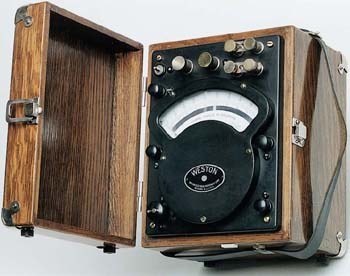 A PHASE ANGLE METER manufactured in the USA by Weston Electrical Instrument Corporation, Newark, New Jersey. The instrument measures the angle between the current and the voltage in an AC circuit when these quantities are represented by vectors. Range selection by selector switch. Voltage selection by terminal. Current selection by terminal and link. It is a portable instrument in a wooden case with cover and leather carrying handle. One terminal top is missing. 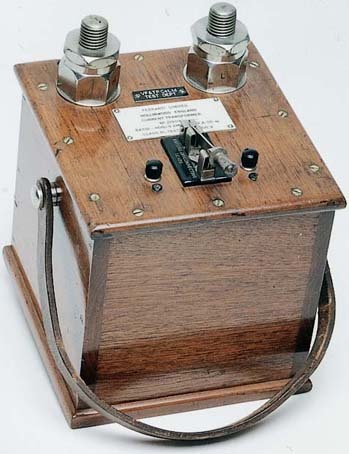 A FLAME-PROOF MINE TELEPHONE manufactured by Siemens Brothers and Company Limited, London. Circa 1946. 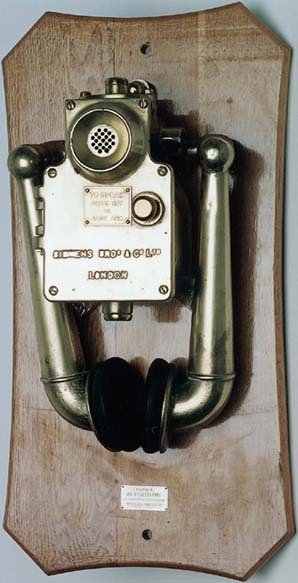 This type of telephone was used in fiery mines and industrial situations with high ambient noise levels. This particular phone is mounted on a wooden baseboard with an inscribed plaque. The inscription reads "Presented to Mr. H P Alexander as a memento of his association with Colenso Power Station." Mr. Alexander was ESCOM’s Regional Manager in Natal. The telephone is now part of the South African Institute of Electrical Engineers historical collection and can be viewed in Observatory, Johannesburg, South Africa. A PORTABLE MILLIVOLTMETER manufactured by Siemens and Halske, Germany. It is believed it was built circa 1900. 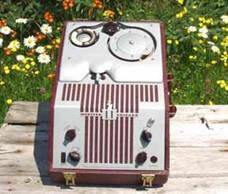 It is a portable, moving coil type that was used with external 60 millivolt shunts. 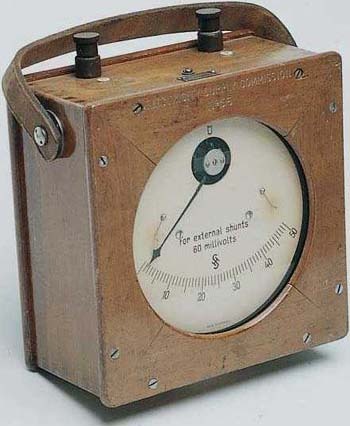 A PORTABLE AC/DC VOLTMETER believed to have been manufactured by Hartmann and Braun, Germany in 1897. It is believed that this instrument was first used by the General Electric Power Co., Ltd., Germiston and was later taken over by the Victoria Falls and Transvaal Power Co., Ltd. (VFP). It is a portable moving iron type for measuring voltage in AC or DC circuits. It is housed in a wooden case with a lockable front flap and brass-carrying handle. 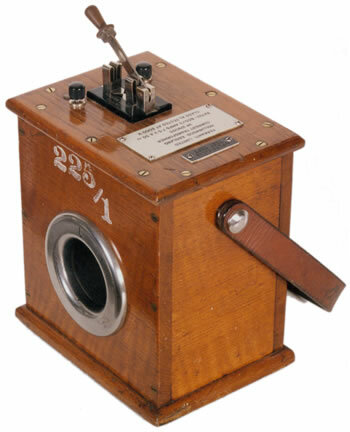 A PORTABLE WHEATSTONE BRIDGE made by H. Tinsley and Co., London. Circa 1940. This is a portable, laboratory type used for the measurement of medium range resistance. 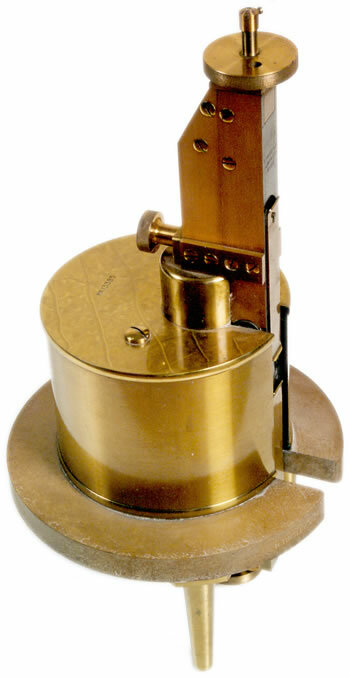 The instrument has both Battery and Galvanometer keys, each with provision for locking in the "on" position. Contained in a Teak case without lid. N.B. 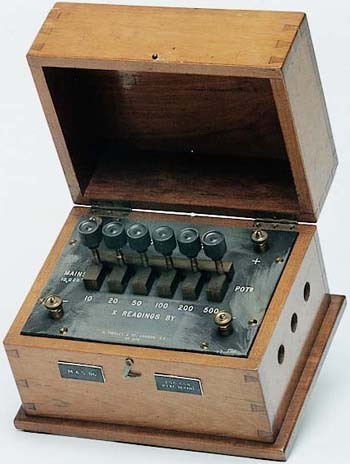 This portable version of the Wheatstone Bridge was, at one time, commonly known as a "Post Office Box"
The Wheatstone Bridge circuit is one which is used extensively for the measurement of medium range resistance (typically 1,0 to 100 000 ohms), both as a precision method in the laboratory, and in a modified form, as a portable test set generally known as the "Post Office Box." It also forms the basis from which many other "bridge" networks have been developed for both AC and DC measurements. The general arrangement is shown in the diagram. R1 and R2 are known as the ratio arms and are generally adjustable to one of four values, such as 1,0, 10, 100 and 1000 ohms. R3 is the reference standard and is variable typically between 1,0 and 1 000 ohms in steps of 1,0 ohm. Rx is the unknown resistance. G is a sensitive galvanometer. The bridge is balanced (i.e. Zero deflection of the galvanometer) by adjusting R3. At balance the value of the unknown resistance is given by Rx = (R2/R1) x R3. The extreme sensitivity of the circuit makes it particularly suited to strain measurement in conjunction with a resistive transducer. Modified versions of the Wheatstone Bridge are used for the measurement of inductance and capacitance. 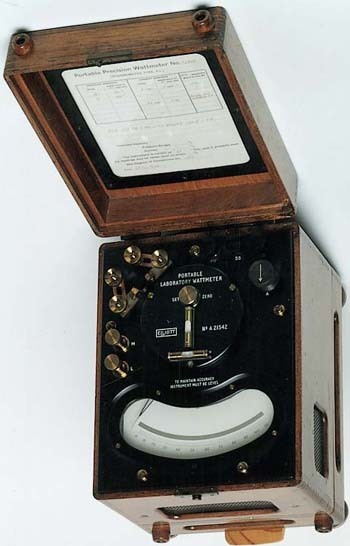 A CONDUCTIVITY METER made by Evershed and Vignoles, London. Circa 1935. This instrument was supplied by British Agencies Limited, Johannesburg. The conductivity meter is essentially a resistance-measuring device arranged to display the reciprocal of the resistance i.e. the conductivity. It has a moving coil movement without control springs but with two moving coils so connected that their resultant torques are in opposition. The one coil carries the current (I), or a definite portion of the current, flowing through the test piece. The other, a current proportional to the voltage applied (V). The displacement of the movement at balance is proportional to the ratio of the two torques i.e. V/I which, by Ohm's Law, is proportional to the resistance or inversely proportional to the conductivity. A hand driven generator built into the instrument case provides power. The instrument is a portable type used to measure the conductivity of earthing systems, electrolytes, etc. The instrument is housed in a wooden case with levelling screws. 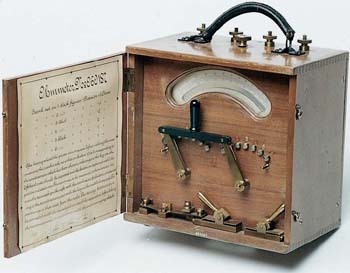 A UNIVERSAL GALVANOMETER made by Siemens and Halske, Germany in 1897. Siemens and Halske supplied this instrument to the Rand Central Electric Works (RCEW) after the construction of Brakpan Power Station in 1897. 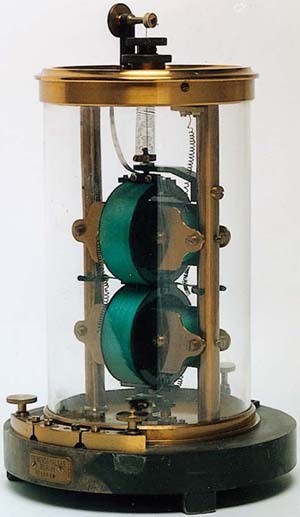 A WHEATSTONE BRIDGE made by Siemens and Halske, Germany in 1887. 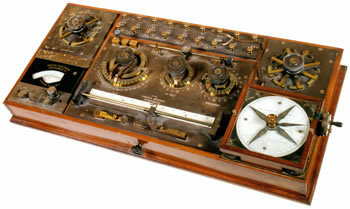 AN ASTATIC ELECTRODYNAMOMETER believed to have been made by Siemens and Halske, Germany in 1887. The function of the mercury arc rectifier is to convert alternating current into direct current. Peter Cooper Hewitt invented it in 1902. It was generally more economical to obtain DC power by conversion from AC than to generate it as DC power. 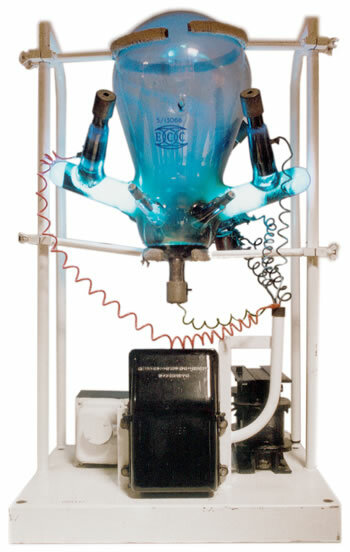 A mercury arc rectifier consists of a glass or metal evacuated vessel containing a mercury pool cathode and two or more anodes. A bright dancing spot on the mercury surface is the source of electrons that move toward any positively charged anodes. Electrons are emitted from the cathode spot and proceed into space where they strike neutral vapour molecules and ionise them by removing an electron. The new electron joins the old in conducting the current. The remainder of the molecule has a net positive charge and is a positive ion. It is attracted to the cathode. As the positive ions approach the cathode, they produce a high space charge potential gradient which removes electrons from the relatively cold mercury surface. At the same time, the positive ions striking the surface heat it and cause a violent evolution of mercury vapour. As the ions are also mercury vapour, a pressure of mercury vapour is built up which enables the electrons to strike molecules after a very short distance. The entire process can thus take place very close to the mercury surface. This enables very few volts to produce a gradient of millions of volts per centimetre at the surface. 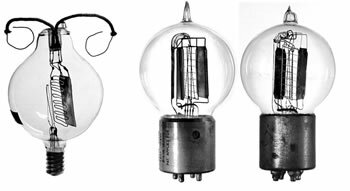 The exhibit is a three-phase, glass bulb mercury arc rectifier made in the United Kingdom by the Electric Construction Company Limited. (ECC) It has type/serial number 5/13068. It is mounted in a metal stand complete with all components to make a working exhibit. The instrument is currently on display at Palmiet Power Station. 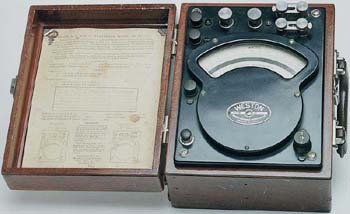 A DC GALVANOMETER made in the United Kingdom by H. Tinsley and Company. Circa 1925. This instrument is a sensitive mirror type. It is approximately 150mm in diameter and measures 250mm high. Serial number 1284. 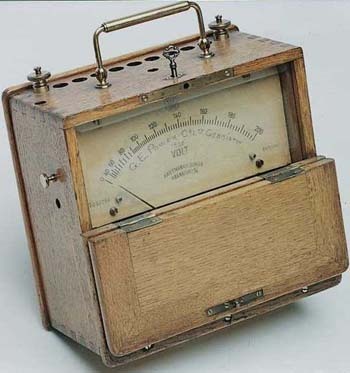 AN AC GALVANOMETER made in the United Kingdom by H. Tinsley and Company. Circa 1925. Printing demand meter (maximum demand printometer) manufactured in USA by General Electric. Circa 1950. Type PD-5. Serial number 626103. Operating voltage 18V DC. Enclosed in a cast-iron case with approximate overall dimensions 300mm wide x 330 high x 205mm deep. 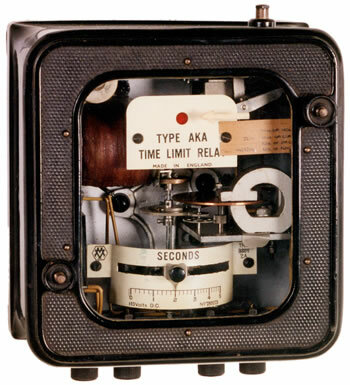 An electromechanical constant definite time delay relay made in the United Kingdom by Reyrolle. Time delay is fixed at 5 seconds. Operating voltage is 15V DC. Type T.D. Article number 415C98. Serial number BQTTD67. Enclosed in a cast-iron case with approximate overall dimensions 240mm wide x 180 high x 110mm deep. A single pole, attracted armature, non-directional, instantaneous over current relay. Manufacturer was possibly the Victoria Falls and Transvaal Power Company Limited or Escom. Enclosed in a cast-iron case with approximate overall dimensions 230mm diameter x 100mm deep. A three pole, balanced beam, non-directional, instantaneous over current relay. Manufacturer was possibly the Victoria Falls and Transvaal Power Company Limited or Escom. Type instantaneous over current. Serial number 8995. Setting range 2 – 10A 50Hz. Trip circuit 24V DC. Enclosed in a cast-iron case with approximate overall dimensions 370mm x 200mm high x 110msm deep. An electromechanical definite time delay relay, made in the United Kingdom by Metropolitan Vickers. Circa 1950. Type AKA. Serial number 788073. Time delay range 0 – 5 seconds. Operating voltage 110V DC. Hand reset flag indicator. Enclosed in a cast-iron case with approximate overall dimensions 185mm x 220mm high x 120mm deep. A potentiometer is used to measure alternating and direct current. It was made in the United Kingdom by H. Tinsley and Company. Circa 1930. Approximate overall dimensions 850mm long x 420mm wide x 90mm high. 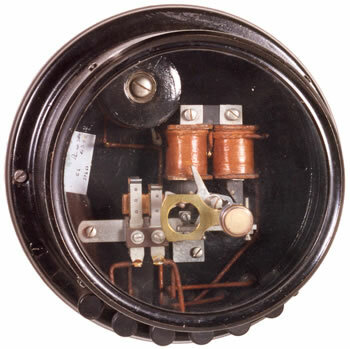 A dry type switchboard current transformer made in the United kingdom by Switchgear and Equipment Company Limited. Reference number W.O. 88T/1. Ratio 15/5. 50Hz. 15VA maximum. Class C. Maximum voltage 11 000V. Approximate overall dimensions 150mm wide x 200mm high x 100mm deep. 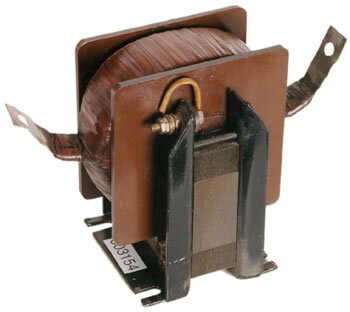 A through type portable current transformer manufactured in the United Kingdom by Ferranti Company Limited. Reference number 219095. Ratio 800/5. 50Hz. 7,5VA. Class AL. Tested at 2000V. It is labelled "VF & TP Co. Ltd. Test Dept." Enclosed in a wooden case with approximate overall dimensions 200mm wide x 200mm high x 140mm deep. A through type portable current transformer manufactured in the United Kingdom by English Electric Company Limited. Reference number PPS 29645. Ratio 500/5. 26 - 100Hz. 15VA. Maximum voltage 6600V. Approximate overall dimensions 320mm wide x 130mm high. Before submarine cables and satellites for transmitting telephone signals became available in the mid 1970s voice communication with overseas countries depended on short-wave radio. This form of transmission exploited the reflection of radio waves by the Ionosphere located hundreds of kilometres above the surface of the earth. The behaviour of this phenomenon was poorly understood and after WWII an international effort was launched to learn more about the technique. It became essential to understand the variations in height of the Ionosphere and the range of frequencies reflected by these layers. Trevor Wadley, employed by the South African Council for Scientific and Industrial Research's (CSIR) Telecommunications Research Laboratory, was given the task of developing a suitable instrument for determining these parameters. The height was measured using Radar in the frequency range from 100 kHz to 20 MHz. 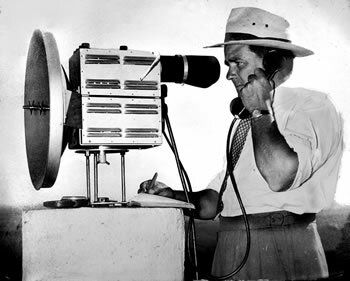 Wadley devised unique equipment which generated bursts of radio signals over the full frequency range without band switching. Likewise his receiver tuned over the full band in a single smooth sweep. This achievement was unique and proved to be very successful. The results were recorded one frame at time on a 16 mm cinè camera and were shared internationally. Other countries developed similar equipment but the range of frequencies was covered in several steps and could not achieve the same elegant results. The Ionospheric Recorder is part of the South African Institute of Electrical Engineers historical collection. Following the success of his Ionosphere Recorder, Trevor Wadley realised that the technique could be extended to produce a radio receiver with continuous frequency coverage. In the early 1950s he produced the prototypes shown in the illustration. Based on a stable 1 MHz crystal controlled oscillator the receiver covered all frequencies from 0 to 30 MHz without gaps. There were two frequency-selecting dials, the first chose the desired megahertz range and the second interpolated between successive megahertz steps. By clever design Wadley was able to achieve exceptional frequency stability combined with accurate tuning calibration. It was possible to set the desired frequency on a cold receiver and when the power was switched on the selected frequency would be available to within 5 kHz - such performance had never been achieved previously. 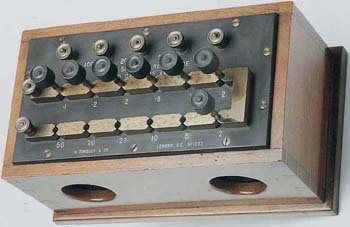 The Royal Navy chose to standardise on this receiver and a small (at that time) British electronics company, Racal, took on the manufacture. It was used all over the world and remained supreme until digital equipment took its place. A transistorised version was manufactured in South Africa, known as the Barlow-Wadley XCR-30, which was very popular with amateur radio enthusiasts all over the world. The Yaesu FRG-7 was produced under licence in Japan. The Wadley Receiver is part of the South African Institute of Electrical Engineers historical collection and can be viewed in Observatory, Johannesburg, South Africa. Before the development of oxide based magnetic tape, "glorified" steel piano wire was the dominant media of choice. The technology of magnetic recording dates back to 1878, when Oberlin Smith proposed the idea of recording telephone signals onto a length of steel piano wire. Over the next thirty years the technology evolved at a "snail's pace"; stalled by lack of adequate and cost effective electronic amplification. 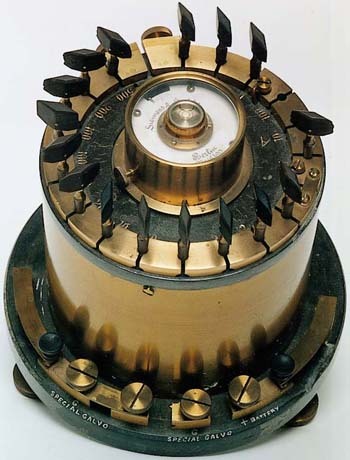 By 1930, advances in electronics allowed the first commercially successful wire recorders to be introduced as dictating machines and telephone recorders in Europe and North America. During WWII, the machines found their way into the BBC who employed banks of them for sending messages to the French underground. Germany broadcast pre-recorded speeches by Adolf Hitler in quick succession from widely separated transmitters to confuse the allies. The early machines used large reels of steel tape at a speed of 1metre/second. The US Army & Navy also employed them for similar purposes in their operations centers. Following the war from 1947 to 1952, wire recorders became popular in America and across Europe, and started showing up in many homes. The advent of oxide based magnetic tape had many benefits over steel wire.... Mainly the ability to record and playback in stereo. Thus magnetic tape put an end to the wire recording era. Signals recorded on steel wire recorders have held up quite well over the years and the sound quality was fairly good considering the limited technology of the day. Approximate dimensions: 430mm long x 290mm wide x 180mm deep. 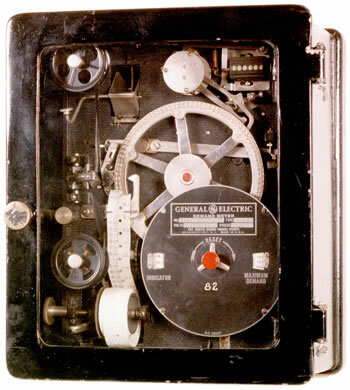 A Wire Recorder is part of the South African Institute of Electrical Engineers historical collection and can be viewed in Observatory, Johannesburg, South Africa. The two coils mounted at the extremities of the pivoted beam were connected in series with four co-axial fixed coils placed above and below the moving coils. The magnetic fields produced by the current interact so as to unbalance the beam and weights are provided to restore the beams to the neutral position. Both AC and DC measurements were possible. International current standards were maintained by similar instruments. 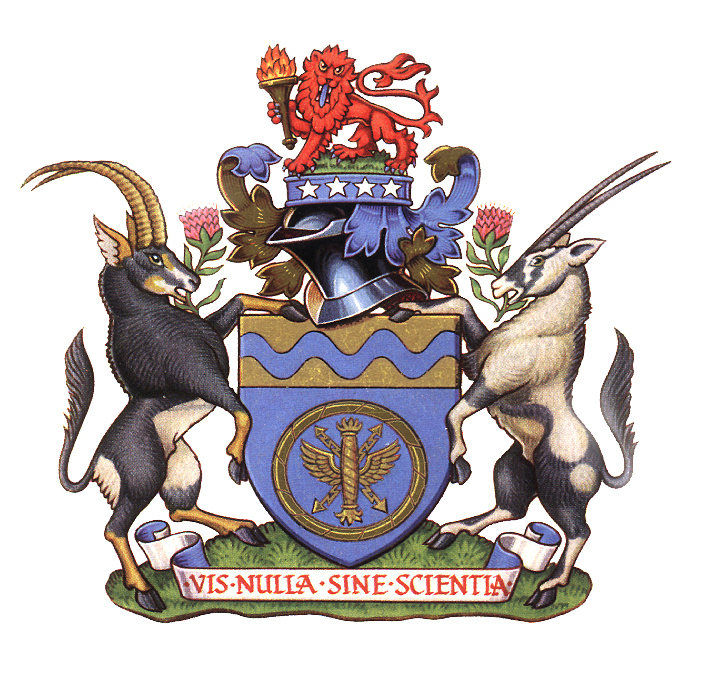 Before World War Two and the formation of the South African Bureau of Standards, the University of the Witwatersrand provided a standardisation service for electrical measurements. This particular instrument was one of the measuring standards. 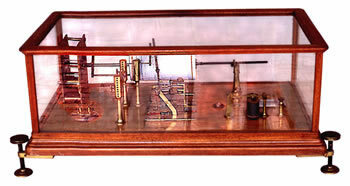 The Kelvin Current Balance is part of the South African Institute of Electrical Engineers historical collection and can be viewed in Observatory, Johannesburg, South Africa. Most listeners were using crystal sets to receive broadcasts in the early 1920s as they could not afford valve receivers. The Galena crystal and "Cats Whisker" diode detector required frequent readjustment. This, combined with the discomfort of wearing headphones, made listening to broadcasts a dedicated pastime. John Samuel Streeter's weekly broadcasts of selected gramophone recordings were transmitted from his Cape Town home from 1919 until September 1924. 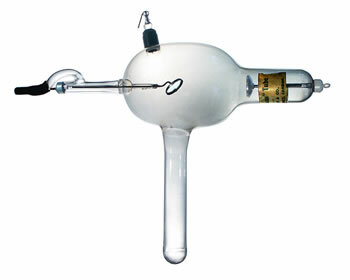 The Burndept Ethophone Junior Crystal Set is part of the South African Institute of Electrical Engineers historical collection and can be viewed in Observatory, Johannesburg, South Africa. A 2-valve-reaction detector and audio amplifier capable of driving an external loudspeaker at distances up to 60km from the transmitter. It required is a 4V accumulator, a grid bias battery and an HT battery. Long, short and medium waves were selected by means of the plug-in coil which was tuned by the rotating short circuited loop. The Marconiphone is part of the South African Institute of Electrical Engineers historical collection and can be viewed in Observatory, Johannesburg, South Africa. It was donated to the SAIEE by the late G D Walker.